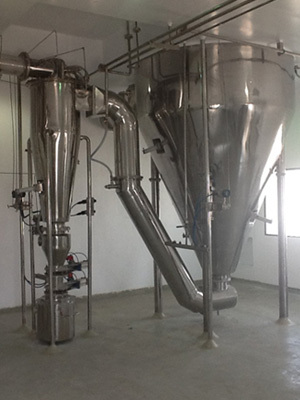 Spray Dryers and Coolers Manufacturer in Pune, India. Conversion of liquids containing dissolved or suspended solids into powder form of required specifications, by evaporation of liquids, takes place in a spray dryer. Spray drying is a highly efficient drying method with possibility to have close control over the particle size, bulk density and moisture content of the dried powder. The spray drying process consists of atomisation of the liquid feed into fine droplets with the help of spray nozzle/s or rotating disc. These fine droplets are brought in contact with hot air in a suitably designed drying chamber. The liquid gets vaporised and the solid particles in dry form are collected at the bottom of the chamber. 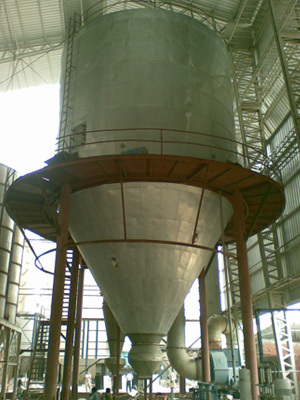 The fine particles which are carried by the air are separated either in cyclone separator or bag filter or wet scrubber. Manufacturing quality as per current industry standards. Operator friendly and safe system. Lowest operation and maintenance costs. Minimum lead time to set up. Complete automation using PLC/ DCS based system as per customer demand. Certifications like CE/ ATEX/GOST-R as per customer requirement provided. High thermal efficiency leading to low fuel cost. Low footprint with layouts as per factory requirements. GMP standards for food and pharmaceutical industries. In nozzle type of spray dryers either two fluid nozzles or single fluid pressure nozzles are used for feed atomisation. The drying chamber for pressure nozzle type of spray dryers are needed to be tall to allow for complete drying of particles. This is because the particles from pressure nozzles are usually coarse and the spray angles are narrow thereby necessitating the drying chamber with lesser diameter and more height. The particle size of the dried product can be controlled by varying the feed pressure and nozzle components. In rotary atomiser type dryers the atomisation is done with the help of rotating disc atomisers. The pattern of liquid spray from rotating disc is such that it is needed to have a large diameter of the drying chamber to avoid the particles sticking to the walls in partially dried state. The height of drying chamber required for this type is less. By varying the speed of rotating disc it is possible to vary the particle size of the dried product. In general, the product obtained from this type of dryer is fine. There are various arrangements of the spray dryers depending upon the pattern of air flow, type of pollution control equipment used, type of air heating method used. Following are the sub types of spray dryers depending upon the air flow pattern. In this the hot air as well as liquid feed enters the drying chamber from the top side. This is a very common type of configuration used and is recommended for all heat sensitive products. 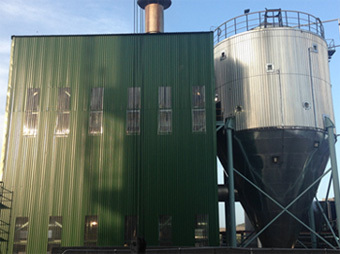 In this the liquid feed is sprayed from the top side and the hot air enters the drying chamber from the bottom side. This configuration is used for products which can withstand high temperature and a product with low bulk density is required. In this the hot air enters the drying chamber from the top and the nozzles mounted at the centre or bottom of the drying chamber, spray the feed in vertically upward direction. This configuration is used when the product in granular form is required and the product is not heat sensitive. The air heating for drying is done by electrical heaters for small capacity dryers and by using steam or thermic oil radiators or oil or gas fired air heaters for production scale spray dryers. The heating using oil of gas as fuel can either be direct or indirect. For products in which contamination of products of combustion is acceptable, direct fired heaters are used. For all other products indirect fired air heaters are used. Depending upon the product collection the spray dryers are of single point collection type or multiple point collection type. In single point collection all the product is either collected below the drying chamber or below the cyclone separator or bag filter. 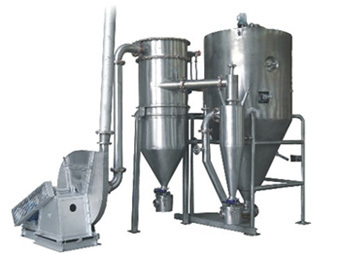 In case of single point collection below drying chamber, the fines below cyclone or bag filter are either pneumatically conveyed back to the chamber or are conveyed by screw conveyor. In case of single point collection below cyclone or bag filter the powder along with drying air is passed from bottom of the drying chamber to the cyclone or bag filter. 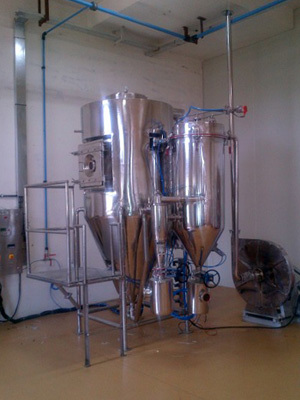 This type of spray dryer consists of an integrated fluid bed attached to the bottom of the drying chamber. 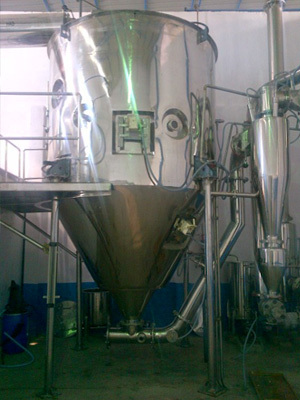 The partially dried powder is fluidised on the fluid bed to achieve agglomeration and further drying. 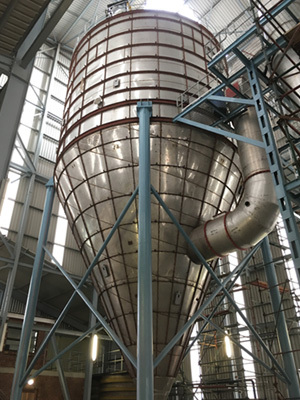 Usually the product discharged from the integrated fluid bed is passed through a secondary vibrating fluid bed dryer for further drying and cooling. This type is used for drying and agglomeration of heat sensitive products like milk. 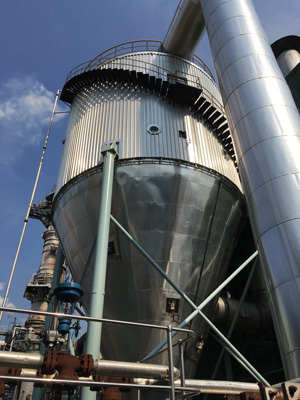 This type of spray dryer is operated with nitrogen as drying media instead of air and the nitrogen gas is continuously recirculated in the dryer, hence the name closed loop. This type is used for drying of products which contain solvents as liquid media and the solvent needs to be recovered. The nitrogen being inert eliminates the risk of explosion or fire due to heating of solvent vapours. After drying takes place in the drying chamber and passing through the bag filter the solvent vapours along with nitrogen are passed through pre-cooler and condenser to recover the solvent. The nitrogen free from solvent is then recirculated to the drying chamber after heating. Spray coolers are used for obtaining powders from molten products like oils, fats, glycerine etc. In the process of spray cooling the products in molten form are sprayed through nozzle or rotating disc atomiser in a cooling chamber. This sprayed material is brought in contact with either ambient air or cooled air depending upon the melting point of the product. As the cooling takes place the cooled product in powder form is discharged from the bottom of the cooling chamber. Particle sizes up to 500 microns are possible by spray cooling. For products requiring extra cooling and where the particle sizes in the range of 500 to 2000 microns are required, fluidised spray cooling is recommended. In fluidises spray coolers, integrated fluid bed is attached at the bottom of cooling chamber just like in the fluidised spray dryer. The fines generated are carried along with air and are separated in cyclone separator or bag filter. The air is handled by centrifugal fans. Technodry System Engineering Pvt. Ltd.